START YOUR CUSTOM LABEL DESIGNS EARLY FOR PRODUCT LAUNCHES IN THE NEW YEAR | Cummins Label Inc. Many companies have been developing new products and recipes for the New Year, and we like to remind customers that it’s never too early to start thinking about your custom label designs as well. Consider your audience: What do you know about your future customers? What are their interests? What will attract their attention? Think about why they would be looking to buy your product, and how you’ll benefit them with your new offering. Hippie Organics created a custom label for their organic blueberries with a nature scene and an owl saying, “Non GMO” – clearly letting their customers know what was inside. Consider your contents. What’s inside this new container? 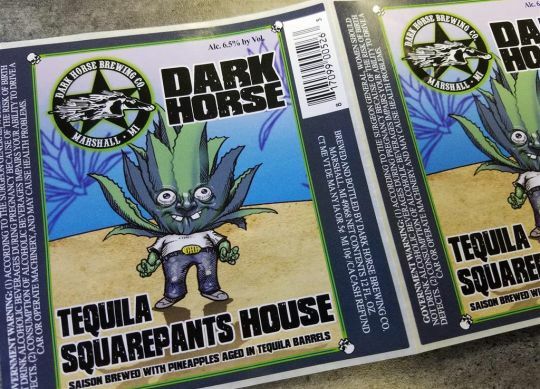 Dark Horse Brewing has done some great labels based on the ingredients inside their craft beers – Like “Tequila Squarepants House” (aged in Tequila barrels) and “Maple Bourbon Barrel Black Bier” (aged in maple syrup bourbon barrels). Each included graphics related to their ingredients. Move forward by blending external and internal ideas. Once you run through all of the information you have, don’t forget about your currently established brand identity. Unless this is your first product release, you’ve already built some brand equity. Part of that brand equity is corporate personality, and new products do well to add to that company story. Don’t be shy about making your own personality shine through. Our designers are available to help you develop your next custom label – call us today to get your new products ready to share with eager customers.